This article was published by the Baxter Bulletin Newspaper January 18, 2011. 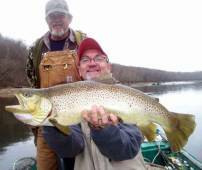 Arkansas Game and Fish Commission Biologist Paul Port grins big as he lifts a 32-inch German brown trout counted in a recent fish sample from the White River. All fish counted and measured in the sample were released. 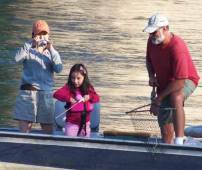 The White and North Fork rivers are teeming with fish of all sizes. An analysis of an October sample of trout taken from the rivers shows managed fisheries producing world-class brown trout and an abundance of hatchery-grown rainbow trout in 11- to 12-inch lengths, says Arkansas Game and Fish Biologist Jeff Williams, head of the Arkansas Trout Program. "It looks good, in my opinion," Williams said during an interview at his office last week. 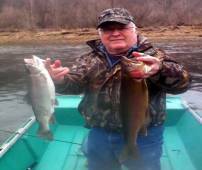 "We saw good numbers, good sizes and healthy fish, and one brown (trout) that measured 32 inches." The leviathan brown came from the Rim Shoals catch-and-release area. Williams said he expected the area, containing some of the best habitat on the White, to produce the biggest fish. 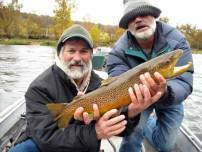 The biologist said he was encouraged again recently by an angler report of another 32-inch brown caught, recorded and released by a patron of a local guide service. The samples were separated by location on the White River. Williams said the White, from a catch-and-release area below Bull Shoals Dam and 15 other sample sites between the dam and the confluence of the Buffalo River, produced fish at a rate of 232 fish an hour — on a par with previous samplings. In the mix, biologists counted 119 German brown trout, 113 rainbow trout and three of the cutthroat strain. 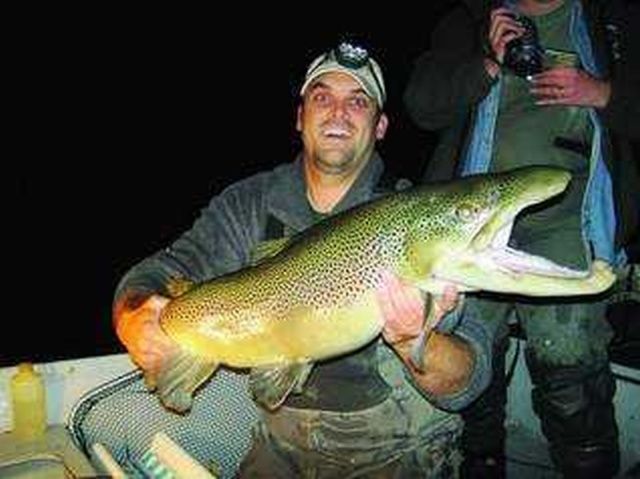 Twenty-six percent of the brown trout sampled on the upper White exceeded 14 inches in length. About 4 percent exceeded 24 inches, Williams said. The sample showed again that Arkansas trout are drawn to the colder 5-mile stretch of the North Fork of the White that flows from Norfork Dam. Biologists counted 429 fish an hour during the shock sampling. 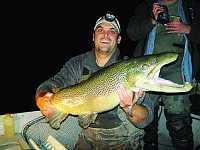 Of that number, 256 were brown trout ranging from 9 to 20.5 inches long with an average length of 13 inches. The North Fork hour sample also included 173 rainbow trout, 32 cutthroat and six brook trout. "The North Fork is still an angler's best chance for catching the Ozark Grand Slam (a creel containing a specimen of all four of the major trout species)," Williams said. Sample areas from the confluence of the Buffalo to Calico Rock and from Calico Rock to Guion produced, as usual, 50 percent to 75 percent fewer brown trout than the colder upper tailwaters. The Buffalo River to the Calico Rock sample area contained a number of stocked rainbow trout comparable to the rainbow upriver. Williams said the fish naturally migrate upstream or to colder waters. The biologist said the sample once again revealed a trout population that does not grow like its competitor strains. The rainbow trout gains about 2 inches a year from the average length at stocking of 11-inches. Brown, brook and cutthroat trout can grow up to 6 inches a year, he said. Williams said the 11-inch stocker rainbow trout remains good strain for put-and-take management plans and anglers who want to harvest fish to cook. But keeping the fish and feeding them in hatchery environs until they grow to the 11-inch length clearly results in a fish that does not forage well when released into the rivers, thus poor growth rates by comparison to the other strains that somehow retain wild foraging instincts, Williams said. An experiment with the wily McConaughy trout strain continues in the White, Spring and Little Red, Williams said. The McConaughy is a challenge to grow to a length larger than 3 inches in the hatchery because of the fishes' instincts to stay at the bottom of hatchery pens. Stockers released at 3 inches also are vulnerable to being eaten by larger fish. Williams said biologists also recently completed a freeze branding experiment with brown trout released to the Beaver Dam tailwaters, Bull Shoals Dam tailwaters, Spring River and North Fork. A total of 38,000 fish were marked with a nitrogen freeze brand that the fish will retain throughout their lives. Fish bearing the brands in future fish samples will provide biologists a better understanding of how the fish performs in the various waters as well as how fish length correlates year to year. Williams said the October sample also will provide a baseline that may show in subsequent samplings how new fishing regulations on the North Fork that nearly doubled the size of a catch-and-release area impacts the size of fish in that river. A new harvest minimum length of 24 inches for brown trout is also a new factor in the management plan that will come into play with future samples.